LANSING — The fundraising totals of Michigan’s largest interest groups continue to trend upward with no end in sight. 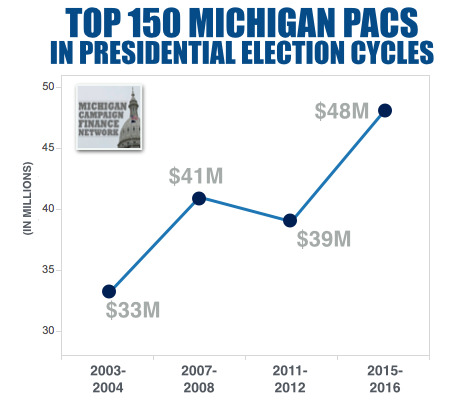 For the 2015-2016 election cycle, the top 150 political action committees (PACs) in Michigan combined to raise $48.5 million. That’s $7 million more than the top 150 PACs have raised in a two-year presidential election cycle before, according to the Michigan Campaign Finance Network’s (MCFN) tracking. In the 2011-2012 cycle, the top 150 PACs raised just $39.6 million. The 2015-2016 total is up 22 percent over that number. The past fundraising high for a presidential election cycle came in 2007-2008 when the top 150 PACs raised $41.4 million — still $7 million below the 2015-2016 total. Large fundraising boosts by the campaign committees of the House Democrats and the House Republicans, who were fighting for control of the chamber in 2016, helped drive up the 2015-2016 fundraising total. 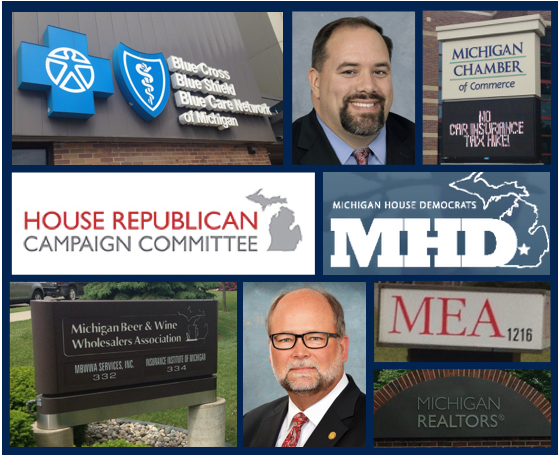 Never before have the House Republican Campaign Committee (HRCC) and the House Democratic Fund (HDF) brought in more than $4 million each, according to MCFN's tracking. They combined to raise $8.22 million for the 2015-2016 cycle. The previous combined high for the caucuses was in the 2005-2006 cycle: $7.17 million. The 2015-2016 cycle is up 14.6 percent over that. HRCC is the main committee that works to elect Republicans to the House. HDF does the same for Democrats. The 2015-2016 cycle also saw a general upward fundraising trend by major PACs that have been active in the state for decades. Of the top 30 PACs in the 2015-2016 cycle, 20 raised more than they reported raising the previous cycle. They include institutional powers like Blue Cross Blue Shield of Michigan (up 2.8 percent), the Michigan Beer and Wine Wholesalers Association (up 11.0 percent) and DTE Energy (up 4.8 percent). These PACs usually take in money from employees, members or executives and then give the money to candidates and political parties. While high for a presidential cycle, the fundraising total of the top 150 PACs for 2015-2016 is below the overall record, which came two years ago in the 2013-2014 cycle. For that cycle, the top 150 PACs raised $68.1 million. In non-presidential cycles, like 2013-2014, the fundraising totals tend to be higher because those cycles — unlike presidential cycles — include races for governor, attorney general, secretary of state and all 38 seats in the Michigan Senate. Still, the 2015-2016 cycle beats many past gubernatorial cycles in PAC fundraising. The 2015-2016 cycle is the third highest in the state’s history overall, according to MCFN's tracking, falling behind only the 2013-2014 cycle ($61.8 million) and the 2005-2006 cycle ($51.9 million). The high number posted for 2015-2016 suggests that 2017-2018 could be a record year for PACs. Using big money to fight for seats in the House, HRCC and HDF were the two most active political committees over the past two years. On Election Day, Republicans won 63 of the 110 seats. Democrats won 47. Those were the same totals the parties won in the 2014 election. HRCC reported $4.21 million in total contributions and receipts over the 2015-2016 cycle. That’s the second highest total in the committee’s recent history. In the 2005-2006 cycle, the committee reported $4.45 million in total contributions and receipts. HRCC reported spending $4.04 million in 2015 and 2016. Its top donors for the two-year period included members of West Michigan’s wealthy DeVos family. Family members of new U.S. Education Secretary Betsy DeVos combined to give $720,000 to HRCC in 2015 and 2016. John Kennedy, president and CEO of Autocam, and his family gave $160,000 to HRCC. Blue Cross Blue Shield of Michigan gave $80,000, and members of the Haworth family gave $80,000. HDF reported $4.01 million in total contributions and receipts over the two-year period. That’s the highest total HDF has reported in recent history. The previous high came in 2009-2010 when HDF reported $3.78 million in total contributions and receipts. HDF reported spending $4.22 million in 2015 and 2016. For the cycle, the committee’s top contributors included the Michigan Association for Justice ($80,000), the Michigan Education Association ($80,000) and the United Auto Workers of Michigan ($80,000). For 2015 and 2016, Senate Majority Leader Arlan Meekhof (R-West Olive) controlled the two largest leadership PACs connected to a lawmaker. Leadership PACs allow lawmakers to raise unlimited amounts of money that they can then give to other candidates and causes. Meekhof’s Moving Michigan Forward Fund raised $521,865 over the year two-year period. His Moving Michigan Forward Fund II raised $513,511 — $200,000 of that total came from Moving Michigan Forward Fund. New House Speaker Tom Leonard’s (R-DeWitt) Michigan Values Leadership Fund raised $441,075 over the cycle, which saw him campaign for speaker and officially clinch the leadership position in November 2016. Rep. Rob VerHeulen (R-Walker), who ran against Leonard for the House GOP leadership job, also raised a large sum for his PAC, the VerHeulen Leadership Fund. VerHeulen’s PAC raised $426,450 over the two-year period. Former House Minority Leader Tim Greimel (D-Auburn Hills) controlled the largest individual leadership PAC connected to a Democratic lawmaker. Greimel’s Greimel for Michigan raised $308,100 over 2015 and 2016. Former House Speaker Kevin Cotter’s (R-Mt. Pleasant) Vision for Victory PAC raised $260,0864. Gov. Rick Snyder’s Relentless Positive Action PAC raised $245,760. And Democratic gubernatorial candidate Gretchen Whitmer raised $76,718 for her Whitmer Leadership Fund. — Two PACs funded heavily by the DeVos family ranked in the top 40 for total fundraising for 2015-2016. Great Lakes Education Project, which supports pro-school choice policies, ranked 19th at $590,300. About 84 percent of the PAC’s fundraising total — $500,000 — came directly from DeVos family members. The Michigan Freedom Network, which often works on economic policies, ranked 37th at $335,514. About 74 percent of the PAC’s fundraising total — $250,000 — came from DeVos family members. 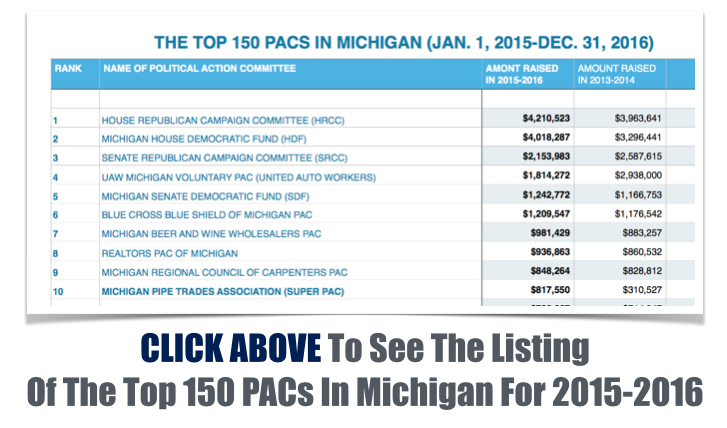 — Working Michigan, a newly formed Super PAC that was funded by labor groups, quickly jumped into the top 25 PAC rankings. 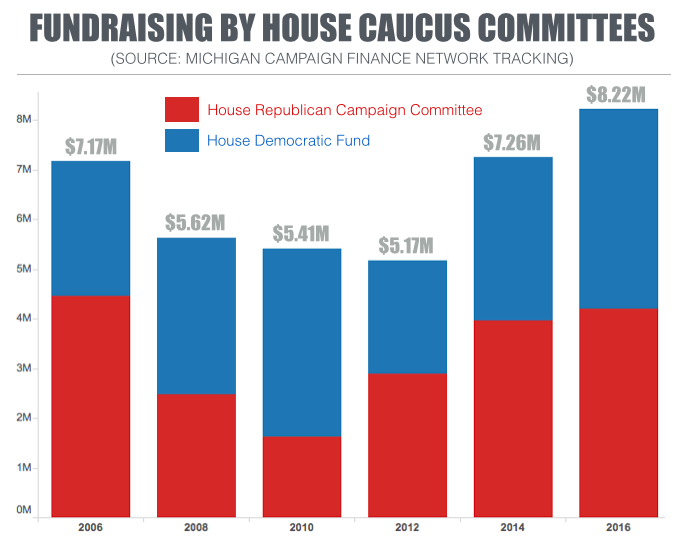 Working Michigan, which boosted the campaigns of Democratic candidates for the House, reported $487,927 in direct contributions between June 21, 2016, when it formed, and the end of the year. It also reported $394,464 in in-kind contributions. The PAC received $200,000 from the United Auto Workers Voluntary PAC Fund and $162,450 in in-kind contributions from the American Federation of Teachers Solidarity 527. — A PAC connected to Rizzo Environmental Services, the trash hauler that has been involved in a corruption investigation in Southeast Michigan, ranked 44th overall for PAC fundraising for the two-year period. The Rizzo PAC reported $295,250 in contributions. — Michigan First formed on Aug. 15, 2016. It went on to raise $250,242 with $217,500 — about 87 percent — coming from committees connected to Senate Republicans. The PAC spent its money on radio and cable advertising to help five House Republican candidates, according to campaign finance disclosures. Its heaviest spending was in the 61st House District, where it paid $103,272 for radio and cable advertising supporting Rep. Brandt Iden (R-Oshtemo Twp.). Iden won re-election.